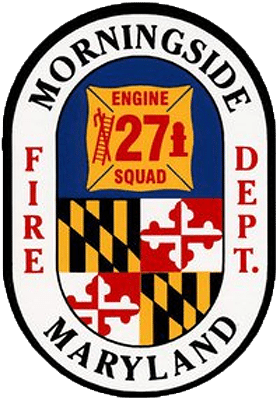 The Morningside Volunteer Fire Department (MVFD) was established March 7, 1945. However, in the years prior, the Village of Morningside had a Civil Defense Organization in support of community-based efforts organized during World War II. Morningside was given a trailer mounted 500 gallon per minute pump. Members of the community who were involved with the civil defense corps all had hitches on their vehicles and when there was a call, they would retrieve the unit and tow it to fires. The pump was kept at Morningside resident’s Charles Benton’s garage on Woodland Rd. On November 22, 1944 a house fire broke out in the town of Morningside on Pine Grove Road killing a four-year-old child by the name of Helen Louise Massey. Her half-sister 29 Year old Mrs. Elaine Josephine (Massey) Haney tried to enter the house to save the child’s life. Mrs. Haney was critically burned and subsequently died the next day at Prince George’s County Hospital in Cheverly, Maryland. The fire was a result of a faulty oil heater. This fire was the direct result of the formation and incorporation of the Morningside Volunteer Fire Department. The first fire truck was purchased for $250.00 from the Oxon Hill Volunteer Fire Department. It was a 1929 model A Ford. Along with this truck came with 100 Ft. of 1 ½ inch hose with nozzle, 140 ft. of booster hose, and ladders. Members only had $200.00 to purchase it and the balance to be paid within 30-60 days. The Department did not have a building at the time were ultimately housed in Joe Caldwell’s garage located at 222 Woodland Rd. On March 7, 1945, the MVFD was officially chartered. The first Board of Directors was Charles Benton, Lawerence Beardmore, Ward Caldwell, Norman Loveless, and Albert Stahl. The MVFD built its first fire station in 1945 in the present day of where the fire station sits today. The first fire station was built primarily on the weekends when the volunteer firefighters were off from work. The fire station was a cinderblock building with two bays. In 1955 it was decided that a newer fire station with more bays to house more apparatus was needed. Work on the new fire station was commenced and a new building was completed in 1955. In 1951, the MVFD purchased its first brand new piece of fire apparatus: a 1950 Ford F8 manufactured by the American fire apparatus company. The Fire Department also purchased an army surplus 1943 Ford to use for brushfires. Moving forward from these humbling beginnings, the MVFD membership continues the pride, service orientation, and traditions of those that came before them. On Sunday, December 29th, 2013, the MVFD took its boldest step forward: 100% volunteer staffing. This decision removed the paid staffing provided by the Prince George’s County Fire Department and in essence, placed the entire obligation to staff all riding positions and operate the firehouse on the MVFD. In this time, the MVFD has provided continuous emergency services and support to the communities it serves. The organization continues to grow in every capacity. Apparatus, the firehouse, the membership, and our processes are evolving into strategy-based programs that are built to last. This is a testament to the continued dedication and can do attitude that started the organization on day one. Day in, and day out, our membership accomplishes the impossible. Staffing is scheduled so there are always qualified members riding, apparatus and tools are checked for proper working order, the firehouse is cleaned, and calls for service are answered with the utmost professionalism and passion to serve. In the background, ownership defines our success; recruitment, training, technology, maintenance, and planning are all balanced in within the daily operations schedule. The officers, the administrative personnel, and the board of directors work tirelessly to make informed risk-based decisions that will ensure the organization is better than when it began.